The town was sited on the bishop's land. Streets were laid out in a grid with rectangular units called chequers which offered plots of land to tenants who built houses and paid annual rent to the bishop. 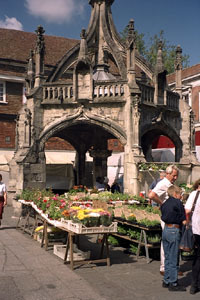 The town center was and still is occupied by a large market place. A hydraulic system diverted water from the river and ran it down channels in most of the streets. Deep ditches, one on the south side of the market and the other along the north side of the Close, provided much needed drainage to an area that was prone to flooding. In the 15th century the town became an important center of the cloth trade.